BERGE-PANTHER MIT Pz.IV TURM. 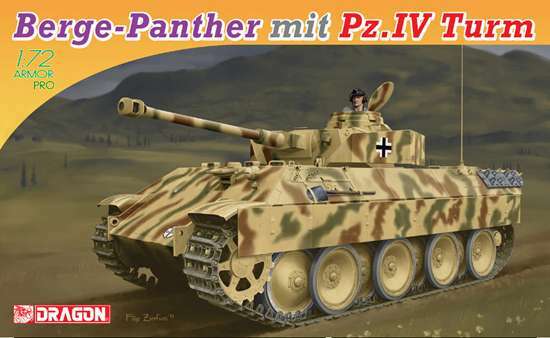 Features: - Authentic Berge-Panther mit Pz.IV Turm rendered in realistic detail - Commander's hatch defined w/subtle detail - Realistic turret roof rendered w/brackets for armor skirts -Well-defined turret skirts can be assembled separately -Finely detailed 7.5 cm KwK. L/48 gun -Engine deck grills molded w/intricate details -Finely detailed exhaust pipes, jack and rear stowage boxes molded on hull rear -Bolts and rivets delicately represented on hull bottom -One-piece slide-molded lower hull -On-vehicle tools reproduced w/clasps -Road wheels presented w/delicate detail -Finely detailed front headlight -Realistically produced jack block -Easy-to-assemble idlers and sprocket wheels look authentic -One-piece DS tracks -One-piece side armor skirts While it’s the impressive Tiger I tank that usually attracts the most attention, it was the Panther that in the long run was a more important tank to Germany during WWII. This 45-tonne medium tank was also converted into a useful armored recovery vehicle known as the Berge-Panther, with nearly 350 examples produced. One particularly unusual vehicle to be created by the unit s.Pz.Abt.653 was a Berge-Panther fitted with a Panzer IV turret. The result was a command tank with a fixed turret, plus a name that was absolutely mind numbing: the Berge-Panther mit aufgesetztem Pz.Kpfw.IV turm als Befehlpanzer. The work was done as a field conversion by only one unit and it served with the aforementioned heavy tank destroyer battalion (originally equipped with Ferdinand and, later, Jagdtiger vehicles) on the Eastern Front in 1944.